Studio lighting for photographers can be intimidating, but it doesn't have to be. I'll help elevate some of the fear in this post. Oh, before I dive in, this post will focus on strobe lighting not constant lighting. 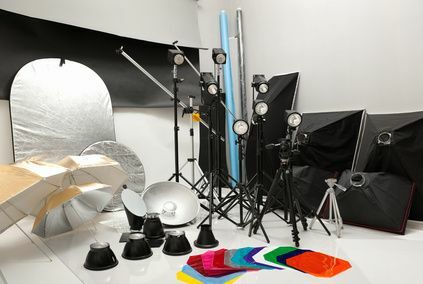 Both types of lighting have advantages and disadvantages, but this post is more about overcoming the fear of studio lighting and starting out with strobes. STOP saying you are a natural light photographer because you don't know how to use strobe lighting inside and/or because you don't own any strobe lighting. I'll give you links at the end of this post to start out on THE CHEAP. You do not have to have the amount of studio gear that you see on the left. I intentionally used that image to overwhelm anyone readying this that is not familiar with using studio lighting. The best way to get started is to start small and just start shooting. Conquer your fear by getting started not continuing to fear by avoidance. A classic, basic studio lighting setup is one light to your left and one light to your right. Typically, you would likely have one stand, one umbrella and one strobe on your left and the other on your right. Although you can start with just one light, the nice thing about two lights is that you can move them around the subject to experiment. You can change the settings by having one put out less light than the other. You can just do more with two lights than one. In addition, if you really want to be a one studio light photographer, by having two lights, you'll have a backup. Rather than continue to fear using studio lighting, why not make a small investment (as little as $200 +/-) and get started? With digital, you can quickly get up to speed by doing a lot of test shots. Technically, you can get started with two lights, two umbrellas and two strobes for under $200 (That's dirt cheap!). If you want something more heavy duty at around $130 each, these would be a good option. If you want to step up in the same power range as the $130 ones above, you can get these for $279 each. You'll need a way to trigger the lights unless you want to run the cord that comes with it into the side of the camera provided your camera has a sync cable connection (or you could get this to run the cable to - hotshoe adapter). Go to Ebay or Amazon and search for "youngnuo triggers" (under $75 for 4 of them- they come in pairs) if you are looking to stay on the cheap side. If you want something more high end, then search for "pocket wizards" ($99 each x 3). You'll need one trigger to mount to the camera hotshoe and you'll likely want one for each strobe or you could use the slave mode on one of the strobes. *Yes, you can find (2) umbrellas on Ebay for $30 or less, but I would recommend going with a 45 inch (minimum) umbrella and here is one option for about $30 or if you want to get some that I have had great success with, here is an option for around $50 (LOVE THESE). Finally, you'll need two light stands. *Yes, you can find cheap ones on Ebay that are not that sturdy for about $15 to $20 each. However, this light stand is my favorite for the money. At $50 each, they are sturdy and will likely last for several years.